All the cloths we sell are 100% hand made and take considerable work to make. I have never seen anyone else make cloths using the high end fabrics that we use. There are many reasons for this not excepting the expensive nature of these materials and the difficulty in working them. Each cloth requires multiple hours to complete and no steps are skipped in the process to create the ultimate dark cloth. Each piece of fabric is cut to exact size, hemmed all the way around the edge then stitched together inside out along the long edge. Velcro is then added to the interior cloth material only and the remainder of the cloth stitched together inside out. Finally the cloth is flipped around right side out and sealed in the corner with a double stitch and tag. Working these two dissimilar fabrics together is very difficult and time consuming. 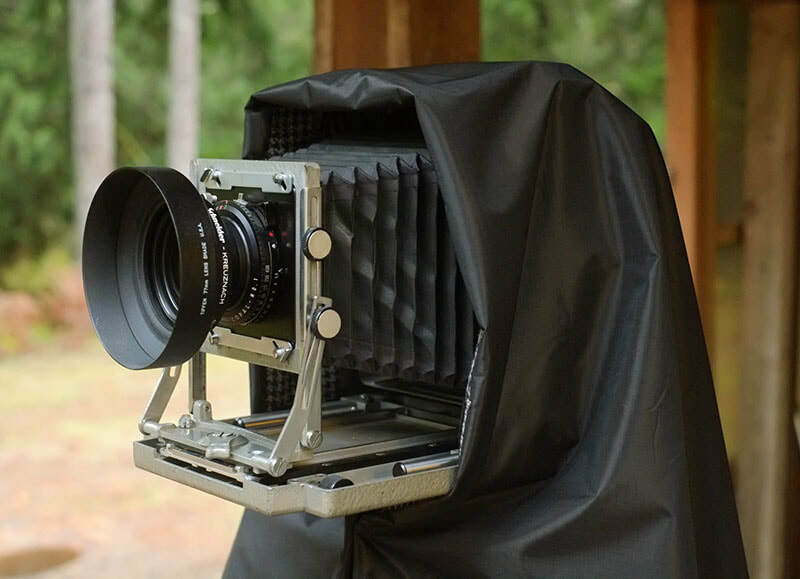 Standard size cloths for 4x5 and 5x7 are finished out at 36 x 48". 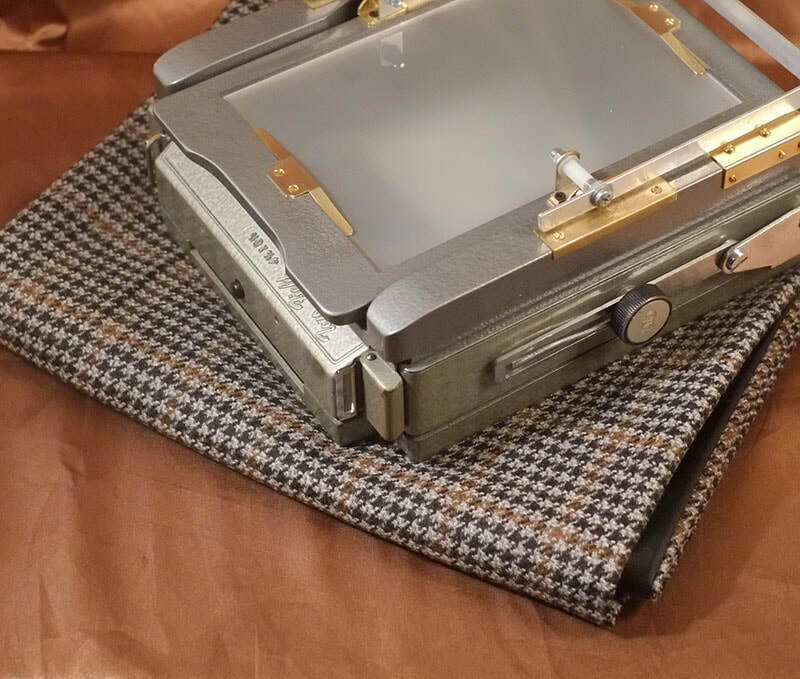 Custom cloths can be made in almost any size you could need including smaller ones for super light travel or very large ones for huge cameras. Since the wool we use is so expensive the winter cloths are made in small runs between 1 and 3 cloths only. The current options should be shown on the bottom of this page thank you. Outside layer battleship gray Gore Tex® waterproof material. This is real Gore Tex® not a cheap water resistant material. Inner layer soft, tight weave jet black cotton. This is high end cotton not cheap material and in combination with the outer layer blocks almost all light. There is no drawstring or elastic to fiddle with a fairly straight forward old school type cloth. There are 12" long pieces of Velcro® brand hook and loop fastener along the front edge if you need to attach it to your camera. You simply stick the cloth to itself. 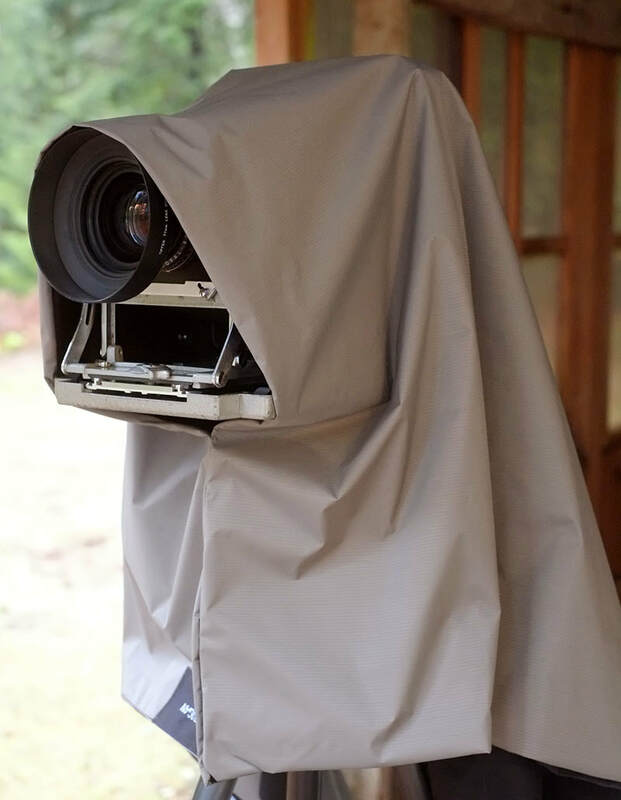 You can see in the photos how I use them one with full camera coverage for shooting in the rain and one with it wrapped around the rear of the camera. With the sock type elastic cloths it's pretty hard to use a rear focus camera and this basic simple style allows easy access to the camera controls. These cloths block pretty much all light and are only about 14 -15 ounces! 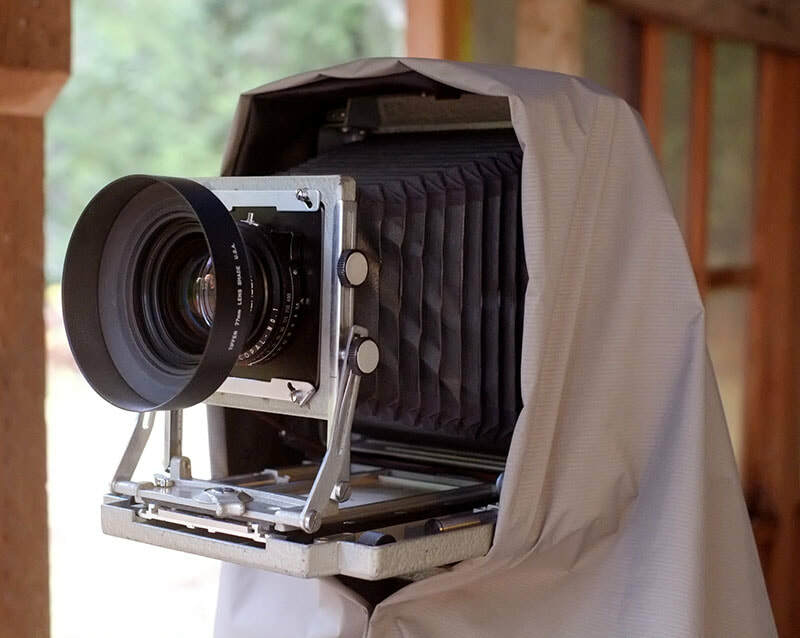 The camera shown is a Toyo half plate with 5x7 back. Outside layer black Gore Tex® waterproof material. This is real Gore Tex® not a cheap water resistant material. Inner layer soft plush wool cashmere blend. Most certainly not a scratchy wool! Medium weight wool one made for suit coats and very expensive high quality material used for very high end clothing. 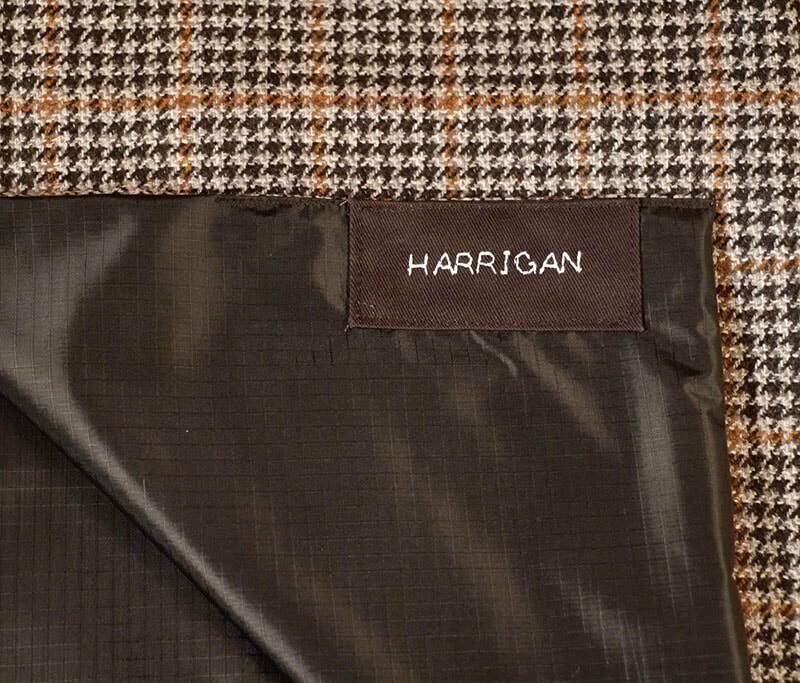 The pattern is a classic houndstooth and looks great. Cloth seen below is sold out and shown for illustrative purposes, specific wool patters available are shown below. 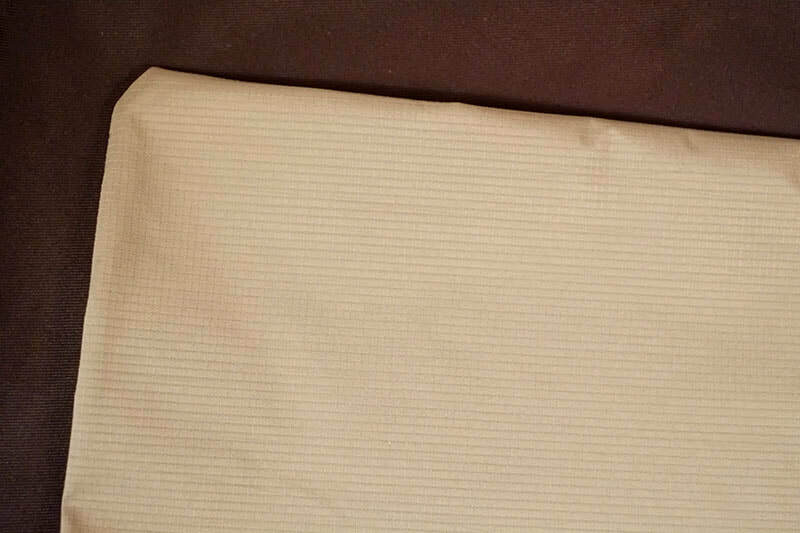 There is no drawstring or elastic to fiddle with a fairly straight forward old school type cloth. There are 12" long pieces of Velcro® brand hook and loop fastener along the front edge if you need to attach it to your camera. You simply stick the cloth to itself. 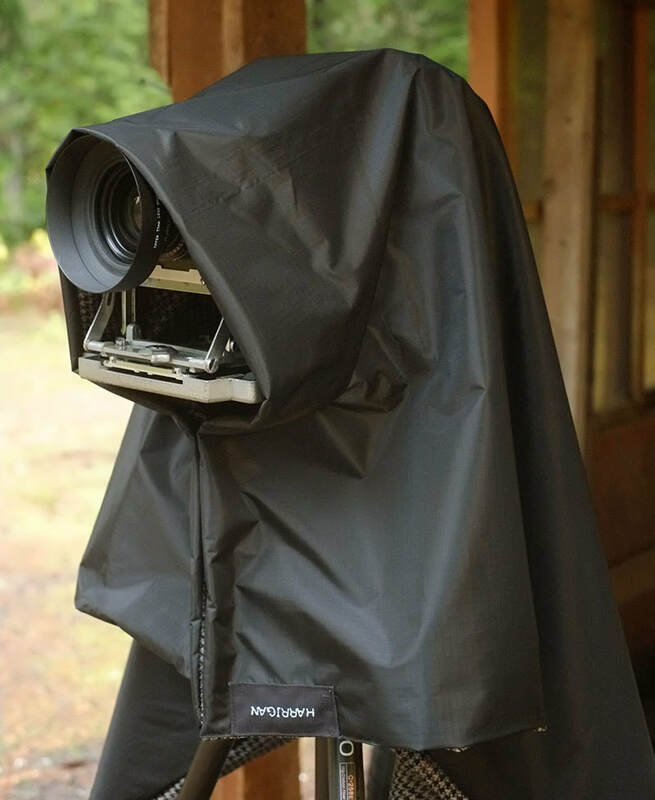 You can see in the photos how I use them one with full camera coverage for shooting in the rain and one with it wrapped around the rear of the camera. With the sock type elastic cloths it's pretty hard to use a rear focus camera and this basic simple style allows easy access to the camera controls. These cloths block pretty much all light and are only about 14-15 ounces! Excellent dark cloth - will be used for many years to come.